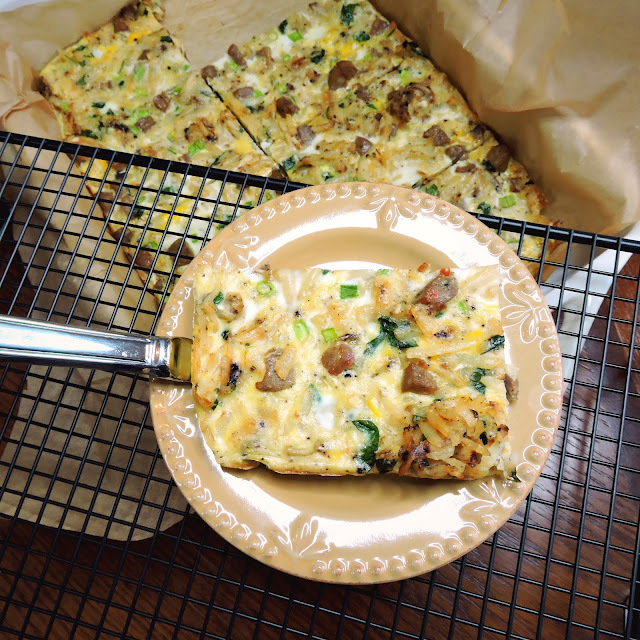 It seems like most families have their old school go-to breakfast casseroles that are light on the eggs, heavy on the cheese and white bread. & While I'm sure that's tasty, I wanted to change this up: Paleo style. Still easy, filling, & enough to feed a crowd, but without the whole bread/cheese scenario~ & I thought frozen hash browns were the perfect replacement. I also wanted something that could be assembled the night before, then baked in the morning. Because, say it's Christmas morning.... Who's wanting to brown some sausage & cook hash browns? (Not me.) I'll be the one with the coffee watching a Christmas parade on TV, checking out everyone's Christmas gifts, while this bad boy bakes in the oven. 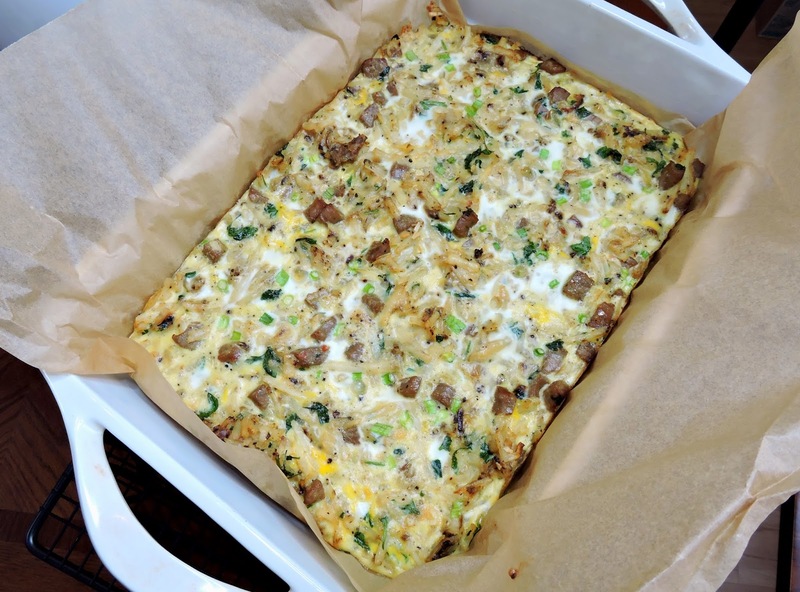 So, whether you're looking for a healthy recipe to kick off your weekdays, or feeding your family on Christmas morning, give this a try! It's as delicious as it is simple to prepare. Enjoy, & make sure to read all of my "notes" for tips & suggestions! Try adding onions, bell peppers, cheese (if you tolerate dairy), mushrooms, bacon, ham, different spices, etc. to make it your own! Preheat the oven to 350ºF. Line the 9 x 13" baking dish with parchment paper (for the easiest cleanup ever). 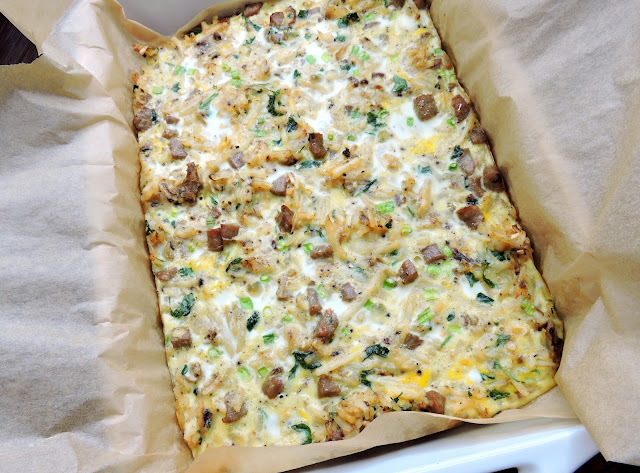 In a large skillet over medium to medium-high heat, cook the sausage until crumbled & no longer pink. (I used fully cooked sausage that I diced into pieces and then browned, because it's easy.) Use a slotted spoon to transfer the sausage to a medium bowl, leaving the rendered fat in the skillet. Add hash browns to the skillet, and cook according to their package instructions in the fat rendered from the sausage. I basically cooked mine over medium heat until they were golden and crispy. 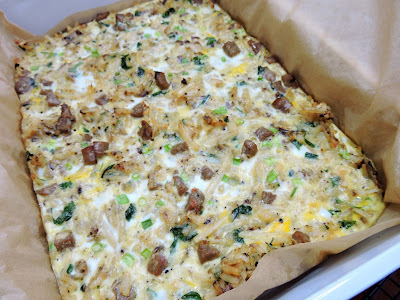 Turn off the stove, and stir the sausage and spinach/parsley into the hash browns. Transfer to the lined 9 x 13" baking dish. Whisk the eggs and spices in a mixing bowl, and pour over top of the hash brown mixture. Bake at 350ºF for 35 to 40 minutes, or until the eggs are set. Slice into squares & serve hot! Thanks for sharing information it is very important for us.